The role of ITGBL1 in facial cartilage development in X. laevis embryos. A) Alcian blue-stained images of craniofacial cartilages in control and Itgbl1-rescued embryos of X. laevis. Upper panels show ethmoidal plates and lower panels show the ceratohyal cartilages. B) Alcian blue-stained images of craniofacial cartilages of control and Itgbl1-overexpressing embryos. Credit: Science Translational Medicine, doi: 10.1126/scitranslmed.aam7486. During cartilage development, chondrocytes secrete the extracellular matrix (ECM) and embed within the same environment. During progressive joint disease, such as osteoarthritis (OA), dysregulation of the process can lead to ECM degradation. In a recent study, Eun Kyung Song and co-workers examined samples of cartilage from patients with OA and found reduced expression of integrin-β-like 1 (ITGBL1) (an integrin inhibitory protein expressed during cartilage development) secreted in the samples. Depletion of the ITGBL1 protein reduced ECM deposition, leading to cartilage damage. Conversely, overexpression of the protein prevented knee joint degeneration in a mouse model of surgically induced OA. The study identified a target to modulate integrin signaling, with potential for therapeutic effects in OA. The results are now published in Science Translational Medicine. Chondrocytes constantly interact with and remodel the surrounding ECM during development and maturation. During cartilage formation (chondrogenesis), the integrin-ECM is regulated differently. Integrin signaling is key to catabolic responses that lead to joint destruction in rheumatoid arthritis and osteoarthritis. The inherent ability of chondrocytes to regulate integrin-signaling in an ECM-rich environment remains poorly understood. In the study, the researchers found that developing chondrocytes expressed the Itgbl1 (integrin-β-like 1) gene, at specific stages to inhibit integrin signaling and promote chondrogenesis. Unlike inhibitors of integrin in the cytosol, ITGBL1 is physically secreted to interact with integrins and down-regulate their activity. In patients with osteoarthritis, Itgbl1 expression was strongly reduced in the damaged articular cartilage. Comparatively, the expression of ectopic Itgbl1 protected joint cartilage against OA development in the destabilization of the medial-meniscus (DMM) induced OA mouse model. The results revealed that ITGBL1 signaling was an underlying mechanism protecting against destructive cartilage disorders. Targeting ITGBL1 can yield potential therapeutic results by modulating integrin signaling in human disease. The ECM-driven signaling process is essential for the pathophysiology of destructive cartilage disorders. The interaction between ECM-chondrocyte is mainly mediated by integrins; heterodimeric receptors for ECM molecules including fibronectin, collagen and laminin. Various subunits of integrin-α and integrin-β are expressed by chondrocytes. The profile of integrin expression is dynamically regulated during chondrogenic differentiation and development of osteoarthritis. Currently there is limited understanding on how developing and mature chondrocytes dynamically regulate integrin signaling, alongside the potential of integrins to exert negative effects on cartilage formation. The ITGBL1 protein was originally termed "ten beta integrin EGF" (epidermal-growth factor)-like repeat domains" due to its secondary structure. Recent studies have indicated the role of the protein during cancer cell migration and in liver fibrosis. The molecular function of ITGBL1 has remained unexamined in developing animals. In vertebrates, including Xenopus laevis (frog), mouse and human, the function of ITGBL1 is highly conserved. In damaged articular chondrocytes from patients with OA, the genetic expression of ltgb1 decreased. The authors used a mouse model of surgically induced OA, to show the protective role of ITGBL1 against OA development in joint cartilage in the study. The authors further explored the mechanism of action of the protein in chondrogenic differentiation within human bone marrow-derived mesenchymal stem cells (hBMSCs). In the experiments, the authors conducted RT-PCR to reveal that the Itgbl1 gene expression gradually increased during differentiation within chondrogenic hBMSCs. When small interfering RNA mediated Itgbl1 knockdown was conducted in hBMSCs, with subsequent induction of chondrogenesis, the Itgbl1 gene expression effectively decreased. The results were observed with immunostaining where control hBMSCs deposited chondrogenic ECM normally, whereas the Itgbl1 knockdown reduced chondrogenic ECM and collagen expression. The study thereafter confirmed the protective role of ITGBL1 against the development of OA in a mouse model in vivo. Depletion of ITGBL1 induced OA-like damage in joint cartilages, which was partially recovered by the inhibition of integrin-α5β1 activities. The results were consistent with a previous study where chondrocyte-specific deletion of integrin alpha 5 protected against OA development. The authors administered an integrin alpha 5 inhibitor, ATN-161 to the animal model displaying OA damage. Although a full recovery to OA-like damage wasn't observed, the lack of recovery was attributed to the activation of other types of integrins that weren't inhibited by ATN-161. Beyond targeting chondrocytes, the fragmented ECM molecules also triggered inflammation responses in other cells. These included synovial fibroblasts, macrophages and immune cells expressed during inflammatory conditions such as rheumatoid arthritis. In the development of arthritis many integrin subunits are dynamically expressed in various cell types. As a result of the sub-type specific nature of integrin inhibitors, it is very challenging to reduce integrin-mediated destructive signals from all cell types. At present, while an increasing number of patients suffer from OA, most treatments only relieve the symptoms without approved medicines to effectively restore damaged cartilage. The study found that the level of Itgbl1 expression in human chondrocytes from patients with OA decreased. 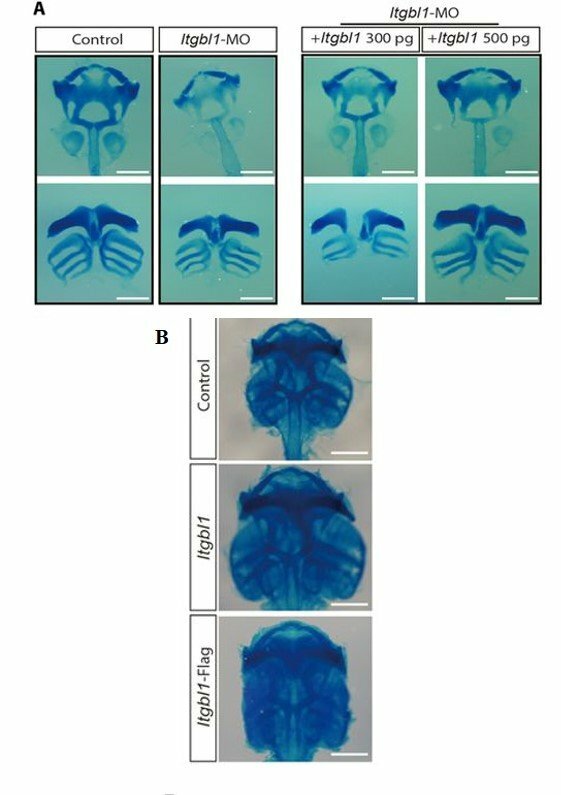 The in vivo studies in animal models showed that ITGBL1 functioned in cartilage development, actively maintained cartilage and protected it from destructive signals. Unlike several other biological forms of integrin inhibitors, ITGBL1 was secreted to reduce integrin signaling by physically interacting with integrin. The unique function of the protein ITGBL1, with its role as a secreted inhibitor of integrin points to new approaches of treating destructive cartilage disorders and integrin-mediated human diseases.